A 1080p webcam sounds a little ridiculous doesn't it. But of course, webcams aren't just for video calls, they're for recording your thoughts to YouTube, presenting a video podcast or lip-syncing to Carly Rae Jepsen. They are, in fact, cheap camcorders that have admittedly restricted mobility, but even so offer lots of promise. The LifeCam Studio is one of few on the market claiming to offer 1080p video. And while we take its performance abilities with a large pinch of salt, it's still impressive to see electronics cut down to this size. Unlike most webcams, the LifeCam looks more like an action camera, designed to be bolted on to your helmet as you fly down the piste. It's a metallic tube with an LED light, single button and microphone built in to the top. It is mounted on a rubber foot that is designed to work in conjunction with any monitor, or nearby surface and it bends and flexes in several directions to make sure you can give it a stable footing before you make your first video call online. There's also a mount on the bottom that would allow it to be fixed to a tripod. Obviously, a full size three-legged support is unlikely to be a fixture of your home office, but you might use it with a GorillaPod or similar to get some interesting desk angles. The camera connects, as all webcams do, via a USB 2 cable. This is a decent enough length, but it's not overgenerous. Obviously, there's a fine line between having a cable that's long enough for desktop users, but short enough to be practical to laptopers too. But we can't see many users giving up on their built-in webcam for this, even if it does offer a massive jump in resolution. It has to be said that Microsoft webcams are, in our experience, the best to use with Skype. Now, given Microsoft owns Skype, that might sound like a given, but it was true long before the MS buyout of Skype. What that means, is that when we call people using this, or any other HD Microsoft webcam, we usually get HD - widescreen video - quite quickly. To explain further, you need to be slightly familiar with Skype and the weird things it does, but essentially, when you have an HD capable webcam, Skype may sometimes refuse to send HD video. This can be because of a lack of bandwidth, but we've made calls to the same people, on the same day, and had other manufacturers' webcams fail to make the HD call, while Microsoft's does with no problem. In our test calls, we found that the quality of Skype calls was pretty good from this camera. Indeed, by far the best we've used so far. If Skype is your game, then the LifeCam Studio is probably a great choice of camera for you. 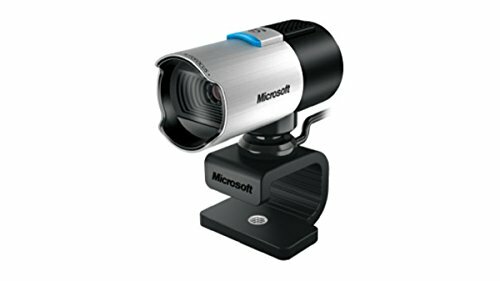 There are a couple of things that we HATE about Microsoft webcams. And annoyingly, these things have been true for all the cameras we've tried from the firm. First, you have to plug it into a USB port on your computer, rather than an extension. Cable extenders may be fine, but we found the hub built into our Samsung monitor would work fine for SD video, but when Skype switch to HD there would be picture break-up all over the place. Switching to a USB port directly attached to the computer solved this problem easily though. The other problem we find even more unforgivable, and it's the autofocus. It quite simply does not work. In our normally lit room, the camera would hunt constantly for a focus lock. Even if the subject of the video - us, in this case - didn't move at all, the camera would still keep looking around for us. This makes using the auto focus entirely impractical. There is a way around this problem though, and that's to turn off the autofocus. Should you have to do this? No. Does the camera have enough going for it elsewhere to make it worth considering? We think it does. The sound from the top-mounted microphone is actually very good, and you will certainly have no problems being understood when using it. The image is very, very good for the most part. When in normal 4:3 mode, it's a little unimpressive, but when you get an app that supports HD and 16:9, the whole thing jumps up and becomes a whole new experience. The field of view is wide, and that gives you a much less cramped and claustrophobic feel in video. There's plenty of detail too, and even in lower lighting conditions there's a decent amount of image quality to make out what's going on. It's not noise-free, but it's better than a lot of cameras we've seen. The auto-exposure is very good too, making up for the shonkyness of the auto-focus. Colours seem very natural too, which is a good thing, and the camera seems to do a good job with its TrueColor (sic) system. This seems to get you a natural, well-balanced image no matter what light you're sitting under. It was even able to cope with our eclectic mix of monitor glow, LED overhead light and standard bulbs. If you're in the mood for fun, install the optional LifeCam software, and you can overlay cartoon animations and special effects onto your video chat. It is incredibly pointless, and the overlays are beyond absurd, but nothing cheers up a serious online video conference like you suddenly sprouting a set of bunny ears. It is a little expensive - although for a 1080p webcam, the street price of £50 really isn't bad - and we are very cross about the auto-focus, but as a webcam the quality is unassailable, and it's a nicely designed camera which plays well with every video chat app we used it with. So if you can live without reliable auto-focus, then this camera will offer you better video quality than anything else on the market. And that's what it's all about, really.